Get the low down on web hosting features in 2017. What is the point of having a website if it is not online for people to see it? Web hosting is a service that hosts or stores your website and provides access to the site when someone online requests access to it. There are different types of web hosting. If you use shared hosting, your website will be saved on a server in a data center along with lots of other people’s websites. It means that all of the websites including your share the computing resources of the same server, this can cause performance issues, such as making your website slow to load. Shared hosting is generally the cheapest type of web hosting. If you choose dedicated web hosting, you have your own server that is exclusive to you, that is no one else’s websites are stored on the server with yours. 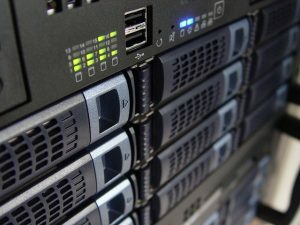 The performance of a dedicated web hosting is great with fast website loading speeds (note: the coding of your website can also influence load speeds) but having a dedicated server is expensive and is not really necessary unless you have hundreds or thousands or millions of visitors to your website each month. Important considerations when choosing web hosting are bandwidth and storage space. Bandwidth is the amount of traffic (transferred data) that the hosting provider will allow to your website. If your bandwidth is only a gigabyte each month, once you exceed this amount you will run into trouble. So a small bandwidth is fine if you only get a small number of visitors each day but if your website becomes popular then it will be insufficient. Your web hosting storage space is the amount of data (files) you are permitted by the hosting company to store on their server. How much storage space you will need will depend on your website. If you have a text-based blog or website with a few images then it probably will not take up a lot of space. If you want to have a lot of large media files (high-resolution images, videos, audio files) or other large files then you will run out of room quickly. Cloud hosting is a recent hosting option. Cloud hosting means that your website is stored on several servers in a network instead of just one server. The advantage of this is that there is plenty of capacity for your website to grow with your needs. Typically with cloud hosting you only need to pay for the resources you are using at the time which can be scaled up and down with your needs. Compare the best web host types for your needs: shared hosting; VPS hosting; cloud-based hosting & dedicated hosting. When you start a website or blog you will need web hosting. Free hosting is most suited if you do not plan on having many visitors. With free hosting, there is often restrictions compared to paid hosting. This can be a limited selection of website themes; only a small amount of bandwidth and storage for your site. Furthermore, many of the free sites will have their branding on them and advertisements that are placed on your site. For more flexible and professional web hosting a paid hosting is appropriate, especially if you plan to grow your website or it will be used for a business. Shared hosting can be a good place to start if you are a new business and are only starting to grow the number of visitors your site has. Once your site is becoming popular you probably want to move to cloud hosting or dedicated hosting.